This is your official invitation to join me for a day at the Adirondack Museum from 10 a.m. to 2:30 p.m. Sunday, Sept. 2 for the Adirondack Attic Top 100 Challenge Tour. We'll be updating the Adirondack Attic Top 100 Challenge, making sure all the artifacts are still on display as they were two years ago when I created the list. Meet us at 10 a.m. in the lobby of the Visitor Center on Sept. 2. You will be responsible for your own admission; however, I believe admission is free on Sundays for year-round Adirondack Park residents. Proof of residency such as a driver's license, passport, or voter registration card is required. If you have copies of the Adirondack Attic book series, please bring them, but make sure you have your name printed inside them to prove that they are pre-purchased so you don't get stopped at the bookstore for shoplifting. If you don't have the books, that's OK. You can either purchase them at the museum's bookstore or download a PDF copy of the Adirondack Attic Top 100 Challenge (2010 edition) to help guide your way. Owning the Attic books is not a prerequisite for this tour, as my goal is to update the list. Please print this PDF and bring with you on Sept. 2. Copies will not be supplied on the day of the tour. 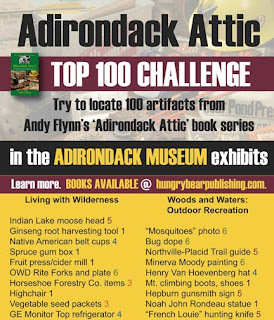 I created the Top 100 Challenge for people who want a self-guided tour of the Adirondack Museum's artifacts on display, as told in my Adirondack Attic book series. 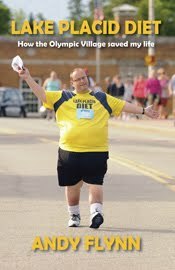 With more than 300 stories in the six-volume set, the Top 100 are obviously just a sampling of my work. By visiting the objects on display, book in hand, you get a much richer version of the story behind each artifact, beyond the signs posted at the museum. It's meant to be interactive. On Sept. 2, we will be visiting each of the exhibits to update the Top 100 Challenge, and the updated PDF will be available soon on the Hungry Bear Publishing website. 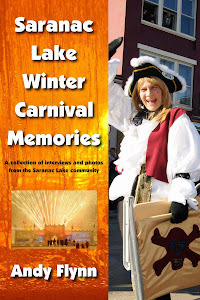 As a group, we can discuss the artifacts and Adirondack history in general. But there are 100 objects, so we must not be too slow. 2:30 p.m. End author-led tour at the museum store. The museum is open until 5 p.m., so you may visit the exhibits not included in the Top 100 Challenge at this time. Times are subject to change as we move from exhibit to exhibit. The Sept. 2 tour is offered at no additional charge, and it is not a program of the Adirondack Museum. I am doing it on my own, as a free service for Adirondack Attic fans. Preregistration is required by Saturday, Sept. 1 by calling Andy Flynn at (518) 891-5559 or emailing me at adkhungrybear@yahoo.com. The group limit is 12.